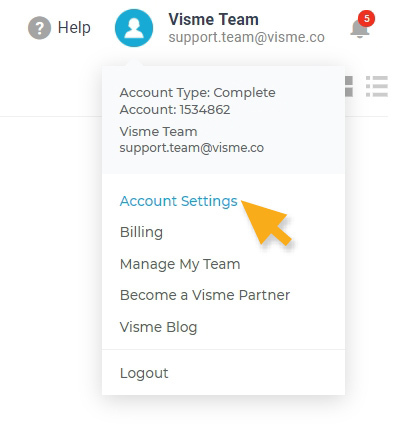 To upgrade an account, click on your name at the top right of the screen in your Dashboard and select Account Settings in the dropdown menu. If you have a Basic or Standard account you can upgrade your account to the next available plan. Note: For example if you have a Basic plan you can subscribe for either the Standard or Complete plans. And if you have a Standard plan you can upgrade to a Complete plan. Once you upgrade to a premium plan, your account will automatically be upgraded to use Premium features. You may need to access the Visme editor and then refresh your browser to launch premium features. Note: The premium status will run down all of your projects. That means even if you created a project as non premium user, it will be capable of supporting all premium features available under your account the next time you access and publish it.